Chinese Olympic swimming champion Sun Yang has been in held in a detention centre after crashing a powerful Porsche that he was not licensed to drive. 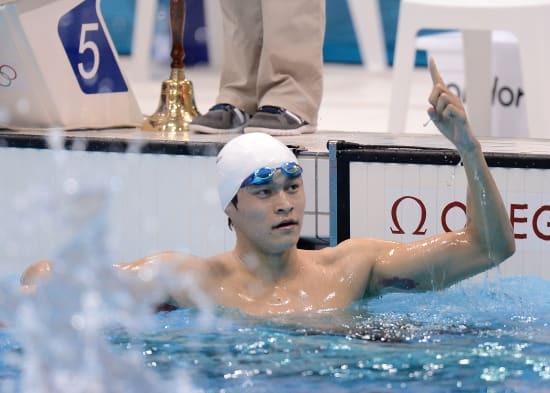 Sun Yang shot to fame when he became the first Chinese man to win the Olympic swimming gold in both the 400 and 1500m freestyle events in London last year. The champion swimmer was not hurt in the accident that happened on Sunday afternoon in the eastern city of Hangzhou, the state-run Xinhua news agency reported, but police have handed him seven days of "administrative detention" and an undisclosed fine. Xinhua reported that Sun was driving a Porsche Cayenne SUV he said he had borrowed from a relative when a bus hit him from behind. Hangzhou police then discovered he could not produce a driver's license. The gold medal winner took to his Sina Weibo microblog to apologise to his fans, saying: "I should have been a role model as an athlete and a public figure but I failed my responsibility," he wrote on the popular Twitter-like platform. "I am deeply sorry for what I have done and will reflect on my behaviour. Because I have been focusing on training and competition, I had only a hazy knowledge of the law, which led to my mistake," he added. "After this incident, I will strengthen my knowledge and study of the law to prevent such a thing from happening again. I hope that everyone will take this as a warning and give me an opportunity to correct my mistake." This isn't the first time Sun has hit the headlines for all the wrong reasons - in February he was suspended from all commercial activities for breaching a "series of team rules". According to Xinhua, Sun had fallen out with his long-time coach Zhu Zhigen who felt the swimmer had too many commercial obligations.